German climate science skeptic site wobleibtdieerderwaermung (wherestheglobalwarming) recently posted on the Arctic and Greenland, mentioning that the Arctic winter has already started there as temperatures above 80° north latitude dip below zero. Chart above shows that a major swath of the Arctic, North Atlantic and North America has seen cold temperatures this year. The blue areas show ice growth, while the red areas show loss and are miniscule by comparison. The DMI: “Map of the accumulated surface mass balance (in mm water equivalent) from September 1st to now”. Source: http://www.dmi.dk/mass-budget/. The total daily contribution to the surface mass balance from the entire ice sheet (blue line, Gt/day). 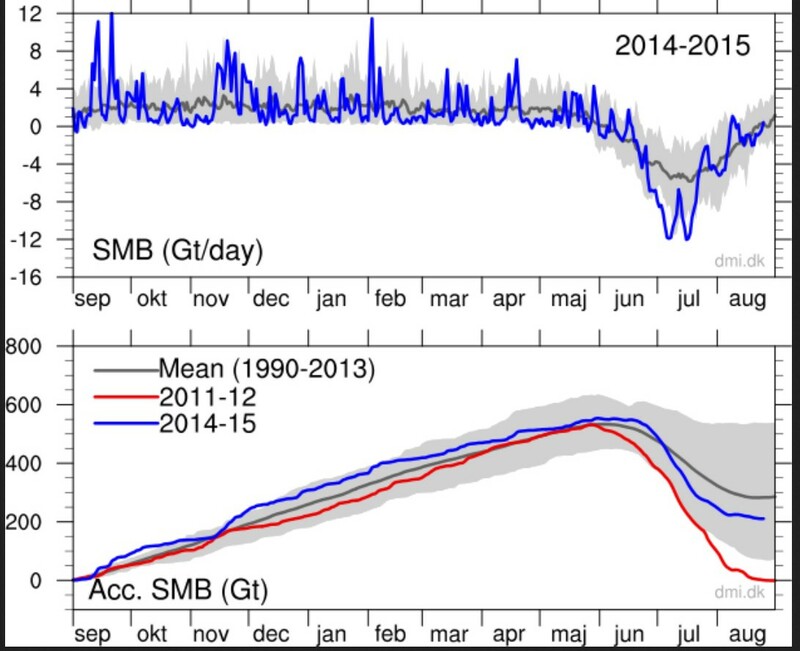 Bottom: accumulated surface mass balance from September 1st to now (blue line, Gt) and the season 2011-12 (red) which had very high summer melt in Greenland. For comparison, the mean curve from the period 1990-2013 is shown (dark grey). The same calendar day in each of the 24 years (in the period 1990-2013) will have its own value. These differences from year to year are illustrated by the light grey band. For each calendar day, however, the lowest and highest values of the 24 years have been left out. 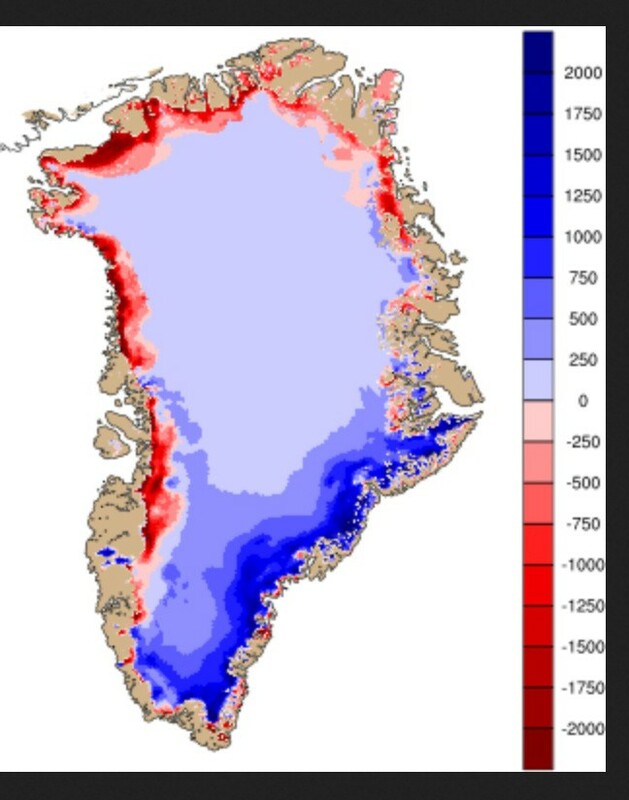 Source: http://www.dmi.dk/ice-sheet-surface-mass-budget/. It really takes a very special kind of person to look at that and see a mass growth rather than regression to the mean after an outlier in 2012. A regression to the mean is identical to a mass growth. Your statement is therefore not even false – it is internally inconsistent. Well I HOPE it all thaws away, giving us a new land to settle on, but, as I am not a lunatic, I don’t actually expect it. Why do you warmunists want so much ice? I live in a place where we have ice every winter. Believe you me, it can be outight dangerous. Yeah, I mean who needs our shorelines? Eff those cities. If you don’t like ice, move to a warmer climate. Or do you expect us to heat up the entire world just because Dirk is afraid of a little ice? Why do you prefer a frozen wasteland Greenland to one that harbors a higher biodiversity, David? Why do you hate biodiversity? Not that it will warm (the climate models are junk). But it would be nice if it did. The trends in the artic and antartic are cyclical, and they are approximately 180 degrees out of phase. Scientist have pretty much came to this conclusion, even the Warmists. 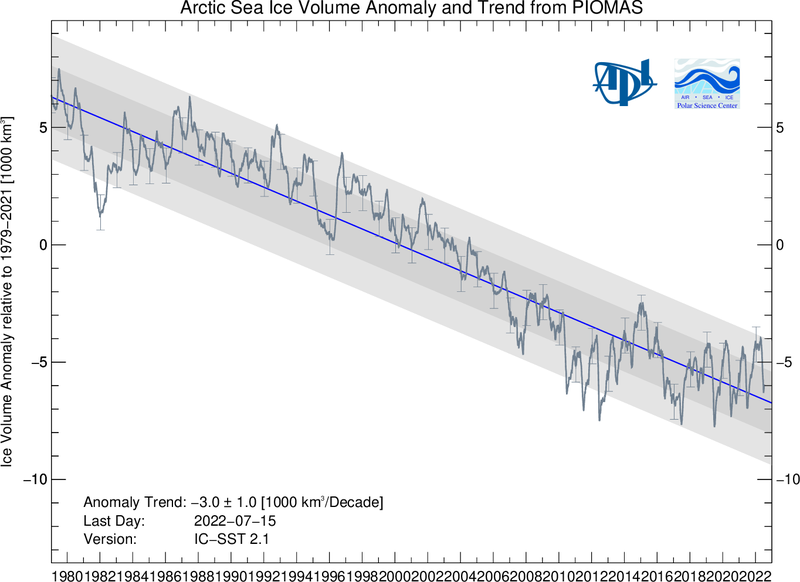 Currently the Artic is due for a rebound and is showing signs and the anartic is due for a reduction after reaching record extents aand is showing signs. Please spare me the arguements that something strange is happening, most of us will be dead by the time future scientists are laughing at our current Warming Conclusions built on samples less than fly dung in the Pacific ocean relative the larger trends. NOBODY knows which way we are going other than 30 yr oscillations that are occasionally affected by Sun Min/Max and Stochastic events like Volcanos. If you want to find out who wins on this subject, you better find a way to extend your life. One bet I would make, is that our scientist have ZERO clues on this subject. It really takes a very special kind of person to argue about a trend SINCE 2014 (the topic of this post) with help of a report card for the year 2014. Update your calendar Anon. You get more information on that webpage! The balance is depending on glacial flow! 200 mm/year flows to the edges. Temperature above 80 north did drop a bit earlier this year but not that impressively. http://ocean.dmi.dk/arctic/meant80n.uk.php cycle through the past 10 years. Those that think the global temperature trend of rising temperatures is still intact are behind the curve. The cooling trend will be very evident before this decade is through. Strangely, none of your prediction failures ever cause you to reexamine your position…..
Gees are you just posting drivel for the sake of drivel? We are only half way through the decade, only a total moron would say the prediction has failed. 2. We have started to cool. 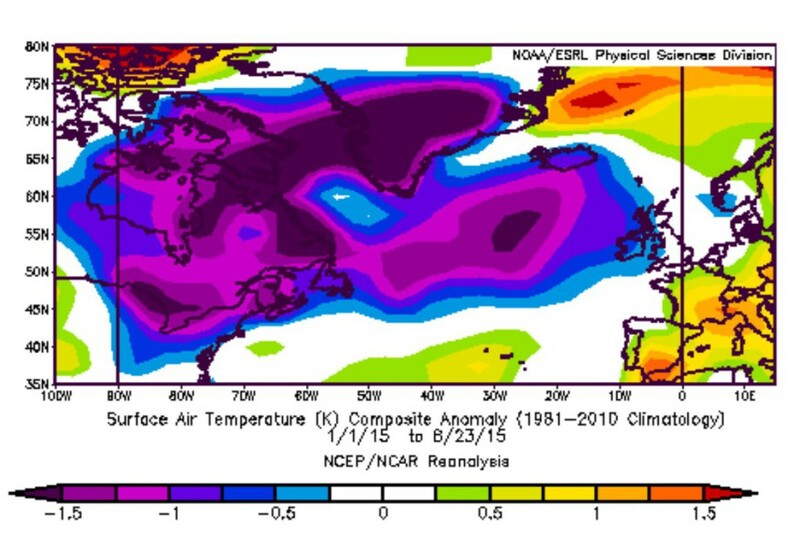 You are confusing the OLR response to ENSO, including clouds, for cooling. Are you acquainted with the parable of the scorpion and the frog? Like the scorpion, it’s his nature, he just can’t help himself. We will be finding this out in the near future due to the prolonged minimum solar activity that is now in progress post 2005. There is absolutely no scientific reason — none — to expect climate to cool down in the foreseeable future. Not until humans stop emitting GHGs and adding to the planet’s greenhouse effect. Your wish to ignore greenhouse warming has no scientific merit at all. Your belief that CO2 causes warming has ZERO scientific basis, and you know it, otherwise you wouldn’t waste your useless time being a fool on science sites. But you need to keep up the deceit for your little science fiction column, don’t you. David, You are a funny man. As if these studies show anything of significance. Are you not aware that 90% or higher scientific knowledge today is completely ignored in the future for being COMPLETELY and UTTERLY misunderstood. If we truly understood the natural processes, wouldn’t we be able to predict it? I think these postulates of curiousity are great and we should continue to investigate, but please spare us that there is any certianty what so ever. There is not. This post is focusing on an eventual trend SINCE 2014, so what is your point? The chart that Anon provided a link to above, clearly shows that there might be a trend change occurring after a decade with a downward trend. And that chart does not even include year 2015. A trend since 2014? What is that supposed to be? and both passages are sort of open. Just remember that during the first 3/4 or so of the Holocene, the Arctic was free of sea ice most summers. And really.. the Guardian as a reference ???.. roflmao. Andy, as usual, has no data to support his claim. You are a science fiction writer.. Stick to that., moron. !! Rotten Appell, I tell you facts.. It is for YOU for go and verify them. Because it is you and I know I am totally wasting my time by giving any links, because you will never bother following them… I leave it to you to verify these facts.. I am not here to teach a brain-washed cretin how to do research. Why the link to the last 1450 years when I mentioned the first 3/4 of the Holocene..
are you REALLY THAT IGNORANT ?? With today’s science practices, doesn’t reconstruction mean, build it my way. Kind of like going to Burger King Right? This should be the Climate Scientist theme song. Sort of open is different from open how? Like, sort of warming is to warming? BTW; the fact that they are called PASSAGES should give you a hint. They OPEN UP. Sod, a lousy attempt for diversion as ever. This post focuses on an EVENTUAL change in the decade long downward trend, but you want to talk about opening of the passages along the Artic coast areas, which have been named passages for a good reason a long time ago. Do yourself a favor and read up on the origin of the term passages in the Artic region. And do try to stay on topic. the article contains the route the ship took. Your hate for the guardian is turning into something absurd! The passages are basically open again. There has been no sea ice recovery! Answer me this, why only data from 1979 till today? Actually 2014, but did earth start on 1979? Do we not have satellite evidence from the 60’s and 70’s? AND doesn’t that show Artic extents similar to today? Don’t bother answering any of those questions, because it is not really a question. It is a scientific fact. As well as so much other facts that show sea ice is a cylclical process. It really is humorous to watch the ignorance, OR willful misrepresentations, which, if the case, is not humorous. JaFree, not sure if your reply was really directed at me but in any case, you should up your argumentation and provide references to support your points and carefully read the posts you reply to (since you seem to have missed my point). which gives a better picture of the cyclical nature of sea ice in the Arctic than the current sea ice references. Recovery from where to where? The first 3/4 of the Holocene when summer sea ice was mostly non-existent. What SHOULD the amount of Arctic sea ice be? Give scientific reasons for your answer. From fig. 01 and 02 it can be concluded that the persistent presence of the polar vortex is causing the displacement. Nothing special and keeping in mind that Greenland is the main energy sinkhole for the northern hemisphere. The issue of AGW is strongly exagerated.